A general map of the country is given at the bottom of this page. Between rolling hills and the River Tweed, the Borders are full of history with many abbeys and castles to visit, not to mention pretty towns such as Peebles, Jedburgh, Melrose and Kelso. Sir Walter Scott's home 'Abbotsford' is a marvellous place to visit, as is his last resting place in the ruins of Dryburgh Abbey. There are plenty of opportunities for walking (including the Southern Upland Way and St Cuthbert's Way), cycling, horse riding, fishing, golf, etc. Known as the leading short break destination in Scotland. The south west corner of Scotland has a beautiful coastline and many picturesque seaside villages along the Solway Firth. There are plenty of opportunities for walking, cycling, mountain biking, horse riding, watersports and golf, not to mention numerous gardens to visit thanks to the relatively mild climate. Galloway has Britain's largest forest park which includes woodlands, moorland, mountains and lochs. Principal towns include: Dumfries (home to Robert Burns at one time), Kirkcudbright (the Artists' Town), Castle Douglas (the Food Town) and Wigtown (the Book Town). Many historic sites including picturesque Threave Castle, Caerlaverock Castle and Sweetheart Abbey. Scotland's largest city sits on the River Clyde. In previous years it has been designated European City of Culture and UK City of Architecture and Design. Home to numerous art galleries and museums including the famous Kelvingrove Art Gallery and The People’s Palace. Also home to Charles Rennie Mackintosh in days gone by. Culturally buzzing like Edinburgh, it is now second only to London in terms of shopping experiences in the UK. Wide range of accommodation from budget to 5 star luxury. The largest expanse of fresh water in Britain, easily accessible from Glasgow. Ideal for activities including boat trips, watersports, golf and walking (close to the West Highland Way). Historically associated with Rob Roy, now part of Scotland's first national park (The Loch Lomond & the Trossachs National Park). 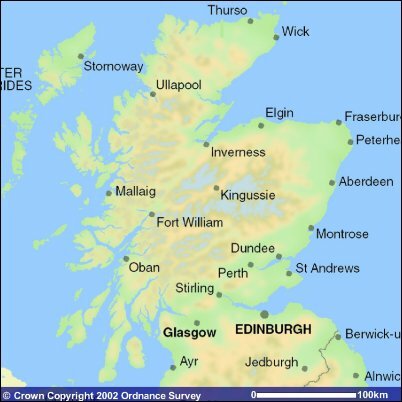 A small island, 20 miles long and 56 miles round, located off the south-west coast of Scotland. Easy to reach from Glasgow. It can be accessed by ferry from Ardrossan (Ayrshire) or Claonaig (Kintyre). Known as 'Scotland in miniature'. It has history (castles and standing stones), wildlife (birds, seals and deer) and leisure facilities (tennis, golf, yachting, pony trekking, bowling, cycling). Something for everyone. For keen golfers, it boasts a choice of 7 courses. Purchased by the islanders in 2002. Achamore Gardens are one of the most popular places to visit on this little island off the Kintyre coast. Visit isle-of-gigha.co.uk (external site) for detailed info. Picturesque peninsula (almost an island) stretching from Tarbert on Loch Fyne to Campbeltown and the famous Mull of Kintyre. Sandy beaches, great views, golf, yachts, castles and historic sites. This small island less than an hour from Glasgow is an easy place to get away to on a short break. It has many sandy beaches, 3 golf courses, several ancient monuments and is home to the exquisitely sumptuous Gothic house called Mount Stuart. This tiny island is easy to reach from the Glasgow area and is home to smallest cathedral in Great Britain. Visit www.millport.org (external site) for detailed info. With its many whisky distilleries, empty beaches, nature reserve and historical sites, Islay is a good place to get away from it all. Known as The Queen of the Hebrides. To get there, take the 2-hour ferry trip from Kennacraig (100 miles north of Glasgow), the boat from Oban or plane from Glasgow. Very close to Islay is this sparsely populated island, home to thousands of deer. George Orwell chose to retreat here and write his novel '1984'. Accessible by ferry from Islay or Oban. Visit colonsay.org.uk (external site) for detailed info. This very popular west coast ferry port is the ideal base for visiting Dunstaffnage Castle, Barcaldine Castle, Ardchattan Priory, Inveraray, etc. and many islands such as Kerrera, Lismore, Mull, Iona, Staffa. Second largest of the Inner Hebrides, this large, unspoilt island has hills, waterfalls, sea caves, standing stones, forest walks and beaches with a coastline of over 300 miles. Home of the BBC TV series called Balamory (Tobermory). Just a short ferry ride from Oban. From Mull, you can take boat trips to neighbouring islands including Iona, Staffa and the Treshnish Isles. Only 5 minutes over the sea from Mull sits this tiny island with its Abbey, now famous for its history relating to Saint Columba and Celtic Christianity. Take a boat trip from Mull or Iona to see the famous Fingal's Cave! Off the west coast of Mull, these two small islands are right on the edge of the Atlantic. Their sandy beaches and wide open spaces make them great places to relax and thanks to their location, they are blessed with a mild climate and sunny skies. Tiree is a popular destination for windsurfing. A popular tourist town in the shadow of Britain's highest mountain, Ben Nevis. In an area full of history and marvellous scenery where Rob Roy and Braveheart were filmed, this is a good place from which to explore West Highland Way and Glencoe. The scenic Road to the Isles leads from Fort William to Mallaig where you can sail over to Skye and all the Small Isles (Eigg, Rum, Canna and Muck). Famous scenic railway line (seen in Harry Potter) with a steam train in summer. A real 'get away from it all' location. This peninsula on the west coast offers sandy beaches, ruined castles and amazing views. Remote, but easy access from Mull & Fort William. The largest and most popular of the Inner Hebrides, this island is famous for its mountain scenery (the Cuillins and Quiraing), waterfalls and castles. Reach by bridge from Kyle of Lochalsh, or by ferry from Mallaig and Glenelg. Skye's neighbouring island of Raasay is well worth a visit too. You can also take the ferry from Skye over to the Western Isles (Outer Hebrides). A beautiful island of contrasts: its rocky east coast looks like the moon, in the west its golden beaches are often deserted. Offshore are the tiny islands of Scarp and Taransay. Just over 90 minutes by ferry from Skye or just a drive over the border from the neighbouring Isle of Lewis which can be reached by air. From Harris you can also sail over to the Uists. Its capital Stornoway is the largest town in the Western Isles and is less than 3 hours by ferry from Ullapool and a plane ride away from many UK airports. The island has lots of unspoilt sandy beaches and is home to the famous Callanish standing stones (second only to Stonehenge). Offshore is the beautiful island of Great Bernera with an Iron Age Village overlooking a spectacular beach. North Uist - Benbecula - South Uist. This chain of islands has alsorts on offer: hills, sandy beaches, nature reserves and ancient monuments. The Uists are reachable by ferry and plane from the mainland and the neighbouring islands. Situated towards the end of the Western Isles chain, this little place has been described as "Barradise" with its hills and beaches. One of my personal favourites for getting away from it all. Accessible by plane and ferry. Approximately 55 miles west of Harris, this little archipeligo comprises the islands of Hirta, Dun, Soay & Boreray. Inhabited for centuries, then evacuated in 1930. Famous for its remoteness and sea bird colonies. Designated by UNESCO as a World Heritage Site. This busy city is the Capital of the Highlands - close to Loch Ness, Culloden Battlefield, Cawdor Castle and much, much more! An ideal base for exploring the Highlands. Take the Whisky Trail or Castle Trail. Visit coastal villages. Situated between Inverness and Aberdeen. Aberdeen is the Granite City but also one of many flowers. This region of north-east Scotland is particularly famous for its Castle Trail and Whisky Trail. A lovely area on the road north from Perthshire to Inverness via Aviemore with a whole range of mountains. Winter ski facilities, scenic railway, castles and even reindeer. Lovely scenery of lochs, forests and mountains in central Scotland. Visit the Queen's View and Blair Castle, as well as many hidden gems off the beaten track. Many pretty towns including Perth, Pitlochry, Aberfeldy, etc. Located at the heart of some wonderful mountain scenery in the north-west of Scotland, it is often busy during the summer due to the ferry for the Isle of Lewis. This part of north-west Scotland is one of the last great wildernesses with spectacular scenery and beautiful beaches. The sub-tropical Inverewe Garden is a must. Ross-shire is a key part of the popular North Coast 500 route (a 500-mile circuit around the northern Highlands which also includes Caithness & Sutherland). These 2 separate counties of Scotland's northern wilderness are home to an amazing variety of Scottish scenery: rocky cliffs, awesome mountains, lonely moorland, remote sandy beaches, castles and standing stones. A long way from anywhere - but certainly worth the journey. A few miles off the north-east tip of mainland Scotland is the group of islands known collectively as Orkney. Here you can marvel at prehistoric villages, ancient tombs, ruined palaces, standing stones, a wonderful old cathedral - the list goes on! As well as being rich in archaeological wonders, the islands have history to tell from this century too, when they were used by the British Navy during both World Wars. Access by plane and ferry. Even more remote than Orkney but a truly unique group of islands. Access by ferry from Orkney or Aberdeen, or by plane. There are already numerous good web sites about Shetland so it's not covered here - start with the official site shetland.org. Situated about halfway between Shetland and Orkney. Visit the community website www.fairisle.org.uk (external site) for detailed info. Choose your destination from the full index.